To improve English oral communication skills, international students and post-docs are advised to engage in various activities, including interacting with native English speakers and practicing their English with computer-assisted language learning software. Note: Due to encryption, check-out laptops should be logged into with an ISU NetID first on campus for the activation of a user account on the computer. Students may use a pronunciation laptop off-campus once they have logged into it on campus. 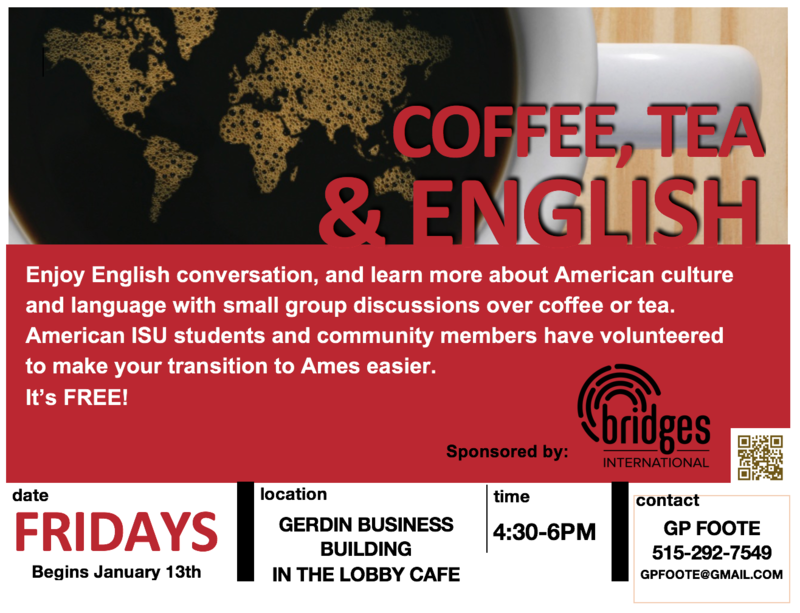 Coffee, Tea, and English is a weekly event where international students can have a chance to practice their English with native speakers in a casual setting. It is offered on Friday afternoons from 4:30 to 6:00 in the Lobby Cafe of the Gerdin Business Building. The event is co-sponsored by Bridges International, CRU, & International Students and Scholars Office. For more information contact G.P. Foote (Phone: 515-292-7549; Email:gpfoote@gmail.com). English Together is an English conversation group that brings together students, faculty, and staff from across ISU to form connections and build community while offering an opportunity for international students and scholars to improve their English. English Together is a great way to welcome and form connections with international students and scholars. Through this connection you will learn about various cultures and perspectives and help others to improve their English. It's a fun and rewarding experience! Beginning Monday, September 14th, English Together will meet twice daily, Monday through Friday, 9-10am and 5-6pm in the Memorial Union Pine Room. If you have any questions, please contact Rebecca Severin (rseverin@iastate.edu) and Kathryn Lundgren (issoprog@iastate.edu). VoiceTown is a multifaceted program that provides individuals with personal coaching to help them improve their English language skills. The lessons are tailored to address individual language difficulties, also focusing on career or discipline specific vocabulary. For more information, contact Dr. Nina Rasmusson at nkdal52@gmail.com.